Signed by illustrator Catia Chien. Alan loves animals, but the great cat house at the Bronx Zoo makes him sad. Why are they all alone in empty cages? Are they being punished? More than anything, he wants to be their champion—their voice—but he stutters uncontrollably. Follow the life of the man Time Magazine calls, "the Indiana Jones of wildlife conservation"as he searches for his voice and fulfills a promise to speak for animals, and people, who cannot speak for themselves. This real-life story with tender illustrations by Catia Chien explores truths not defined by the spoken word. Falling down a well is bad enough, but Anya's normal life might actually be worse. She's embarrassed by her family, self-conscious about her body, and she's pretty much given up on fitting in at school. A new friend―even a ghost―is just what she needs. Spooky, sardonic, and secretly sincere, Anya's Ghost is a wonderfully entertaining debut graphic novel from author/artist Vera Brosgol. Cupcake's life is pretty good. He's got his bakery, and his band, and his best friend, Eggplant. His days are full of cooking, socializing, and playing music. But lately, Cupcake has been struggling in the kitchen. He's sure the solution to all his problems is out there somewhere. But maybe that solution is hiding closer to home. Sara Varon returns with an ageless tale as dreamy and evocative as her break-out hit graphic novel Robot Dreams. At once deeply metaphorical and hilariously literal, Bake Sale is a story for anyone who's ever looked for an easy answer to life's intractable difficulties. It's also a cookbook: Varon includes seven delicious recipes, from classic cupcakes to sugared flower petals to marzipan. In Be Prepared, all Vera wants to do is fit in―but that’s not easy for a Russian girl in the suburbs. Her friends live in fancy houses and their parents can afford to send them to the best summer camps. Vera’s single mother can’t afford that sort of luxury, but there's one summer camp in her price range―Russian summer camp. Vera is sure she's found the one place she can fit in, but camp is far from what she imagined. And nothing could prepare her for all the "cool girl" drama, endless Russian history lessons, and outhouses straight out of nightmares! A 2017 Caldecott Honor Book that The New York Times calls “both classic and ultracontemporary,” Leave Me Alone! is an epic tale about one grandmother, a giant sack of yarn, and her ultimate quest to finish her knitting. One day, a grandmother shouts, "LEAVE ME ALONE!" and leaves her tiny home and her very big family to journey to the moon and beyond to find peace and quiet to finish her knitting. Along the way, she encounters ravenous bears, obnoxious goats, and even hordes of aliens! But nothing stops grandma from accomplishing her goal―knitting sweaters for her many grandchildren to keep them warm and toasty for the coming winter. Vera Brosgol's slyly clever and unexpectedly funny modern folktale is certain to warm even the coldest of hearts. From Sara Varon (Robot Dreams, Bake Sale) comes New Shoes, a heartwarming graphic novel about a donkey on a quest to make the perfect pair of shoes. Francis the donkey is the best shoemaker in the village. He uses only the finest materials: coconut wood for the soles, goat’s wool for the insoles, and wild tiger grass for the uppers. One day he receives a special order from his favorite singer: Miss Manatee, the queen of calypso. But he’s all out of tiger grass! To make the perfect pair of shoes, Francis must journey deep into the jungle . . . and that means leaving his village for the first time. In New Shoes, Sara Varon takes us on a vivid journey into the jungles of South America. From the capybara to the jaguar to the three-toed sloth, Francis meets a variety of animals outside his neighborhood. They’re not so scary when you get to know them! In this universal story of friendship, loss, and redemption, a dog and a robot become friends. But their days of friendship are numbered. This moving, charming graphic novel about a dog and a robot shows us in poignant detail how powerful and fragile relationships are. After a Labor Day jaunt to the beach leaves the robot rusted, immobilized in the sand, the dog must return alone to the life they shared. But the memory of their friendship lingers, and as the seasons pass, the dog tries to fill the emotional void left by the loss of his closest friend, making and losing a series of friends, from a melting snowman to epicurean anteaters. But for the robot, lying rusting on the beach, the only relief from loneliness is in dreams. This new paperback edition of Robot Dreams by Sara Varon includes new backmatter, including a Q&A with the author, behind-the-scenes sketches, and more. Raina Telgemeier’s #1 New York Times bestselling, Eisner Award-winning companion to Smile! Raina can't wait to be a big sister. But once Amara is born, things aren't quite how she expected them to be. Amara is cute, but she's also a cranky, grouchy baby, and mostly prefers to play by herself. Their relationship doesn't improve much over the years, but when a baby brother enters the picture and later, something doesn't seem right between their parents, they realize they must figure out how to get along. They are sisters, after all. 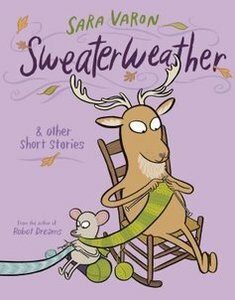 Back before Odd Duck, before Robot Dreams, Sara Varon created Sweaterweather. This endearing, quirky volume is a captivating look into Varon's creative process. It combines short comics stories, essays, and journal entries, and invites the reader into the world of Sara Varon: where adorable, awkward anthropomorphic animals walk the streets of Brooklyn and a surprising, sideways revelation is waiting around every corner. First Second is proud to introduce Sweaterweather to a new generation of readers in this gorgeous jacketed hardcover, with a new cover and plenty of new content. Kristy, Mary Anne, Claudia, and Stacey are best friends and founding members of The Baby-sitters Club. Whatever comes up -- cranky toddlers, huge dogs, scary neighbors, prank calls -- you can count on them to save the day. Baby-sitting isn't always easy, and neither is dealing with strict parents, new families, fashion emergencies, and mysterious secrets. But no matter what, the BSC have what they need most: friendship. Poor Stacey. She just moved to a new town, is still coming to terms with her diabetes, and is facing baby-sitting problems left and right. Fortunately, Stacey has three new friends -- Kristy, Claudia, and Mary Anne. Together they're the BSC -- and they will deal with whatever's thrown their way... even if it's a rival baby-sitting club! Raina Telgemeier, in the same signature style featured in Smile and Sisters, perfectly captures all the drama and humor of the original novel! When The Baby-Sitters Club gets into a huge fight, Mary Anne is left to her own devices. She has to eat by herself in the school cafeteria, figure out how to make new friends, and deal with her overprotective father. But the worst happens when she finds herself in a baby-sitting emergency and can't turn to her friends for help. Will Mary Anne solve her problems and save The Baby-sitters Club from falling apart? Claudia and her sister, Janine, may as well be from two different planets. Claudia, who pays more attention to her artwork and The Baby-sitters Club than her homework, feels like she can't compete with her perfect sister. Janine studies nonstop, gets straight As, and even takes college-level courses! But when something unexpected happens to the most beloved person in their family, will the sisters be able to put aside their differences? Raina Telgemeier, using the signature style featured in her acclaimed graphic novels Smile and Sisters, perfectly captures all the drama and charm of the original novel! In Turtle's shell there's room for only one. But in Turtle's heart, there is room for everyone! 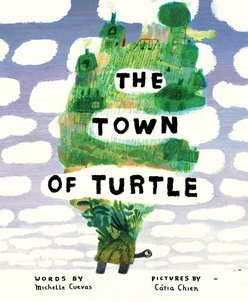 This tale of a lonely turtle who comes out of his shell to find friendship and community celebrates diversity and inclusion. When a solitary turtle decides to make some renovations to his shell, he doesn’t have a blueprint, only a dream for a better life. He starts by building a deck—though he figures the deck could use a fireplace. And a fireplace needs wood, so naturally, he plants a garden. But it isn’t really a garden without a pond . . . Soon, Turtle can barely recognize his own shadow. Finally satisfied with the intricate world upon his back, word begins to spread of the magical “Town of Turtle,” attracting newcomers from far and wide. All are welcome in Turtle’s town, where life is a little less lonely, if only you come out of your shell.